“It’s official: the Detroit Pistons are coming downtown,” claims the Detroit Free Press. I could be drinking the Kool-Aid, but moving the Pistons downtown is a good decision. It will bring in more Detroit jobs and more fans for two reasons. 1) More people reside in the Metro Detroit suburbs (including Warren and Sterling Heights) than anywhere else in Michigan. Of all the Michigan cities’ populations, Warren and Sterling Heights rank #3 and #4, respectively. This move is good since, from Warren or Sterling Heights, driving to Detroit requires half the time of driving to Auburn Hills. 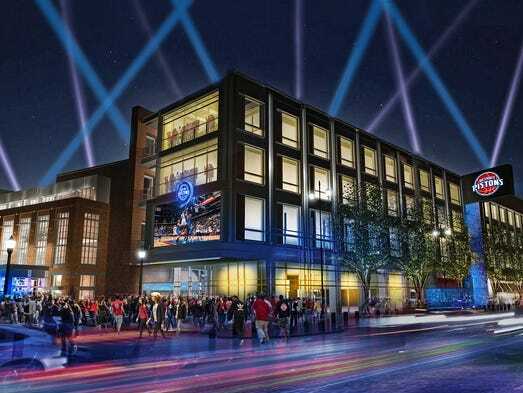 2) I’m sure more fans are attracted to having the Pistons downtown given the bountiful access to restaurants, bars and clubs outside the arena. Nobody outside the state of Michigan wants to watch a Pistons game at an arena where amenities are incredibly limited. Furthermore, small businesses located in Downtown Detroit or the Midtown District (I predict) will be busier than ever with more fans coming into the heart of the city for sports. Having been to Sweetwater Tavern several weeks ago with Daniel Anzaldo and Robert Sadlowski, restaurants and bars can be easily packed with any important games on. Now to those wondering if this decision will kill jobs at the Palace of Auburn Hills, keep in mind that nobody has said anything about closing down the Palace. Now that the Pistons will eventually move out of the Palace, there is more space (or more time allotted) for concerts and other events. Joe Louis Arena is going to close down and be replaced by a hotel (from what I’ve heard), and even if the city decides to preserve the arena, JLA’s sound system and facilities are worn out. Gores’ decision to move downtown doesn’t mean we can no longer use the Palace for other events. I’m fairly certain concerts get sold out anyways. That being said, the next step for Tom Gores is to produce a winning team. The Pistons have been abysmal on the road and it’s affecting their overall record this season. He or the coaching need to figure that out. I could be drinking the Kool-Aid, but moving the Pistons downtown is a good decision. It will bring in more Detroit jobs and more fans. I'm sure more fans are attracted to having the Pistons downtown given the bountiful access to restaurants, bars and clubs outside the arena. To those wondering if this decision will kill jobs at the Palace, keep in mind that nobody has said anything about closing down the Palace. The next step for Tom Gores is to produce a winning team. The Pistons have been abysmal on the road and it's affecting this season's record.